In the library of Schloss Ritter, we can hear the synopsis of 2 books on the occult. They are in the top shelf of the bookcase placed in the center of the wall behind the table. When Gabriel picks up 2 books (twice) of that shelf, the narrator will tell us the summary of the 2 books: Lycantrhopes (werewolves) and Vampirism, an obvious reference to GK2 and GK3. This Easter Egg also appeared in the original Gabriel Knight 1. What do you know about voodoo? Click several times at the side of the entrance of the inner wheel of the snake mound to trigger the "What Do You Know About Voodoo" music clip. When Gabriel calls to the Travel Agency, one of the options is Anderson, Indiana. Game designer Jane Jensen received a BA in Computer Science from Anderson University in Indiana. This Easter Egg also appeared in the original Gabriel Knight 1. Look at the trash can by the entrance door of the police station. The narrator says "Interesting design for a trash can. Must have been on sale at Cops-R-Us. ", a reference to Toys-R-Us. It's possibly also a nod to Droids-R-Us of the first release of the original Space Quest, which was removed from the game after Toys-R-Us filed a lawsuit to Sierra Online for using their name (sort of). If you take a close look at the portraits of Malia's family members in her library, you'll notice one of them is the portrait of Malia of the original Sins of the Fathers. When knocking at the door of Madame Cazaunoux without priest disguise, you can get Gabe to say "Landshark! ", to which Cazanoux replies: "You are no Bill Murray". This is a reference to the early episodes of Saturday Night Live, when this was a recurring sketch. 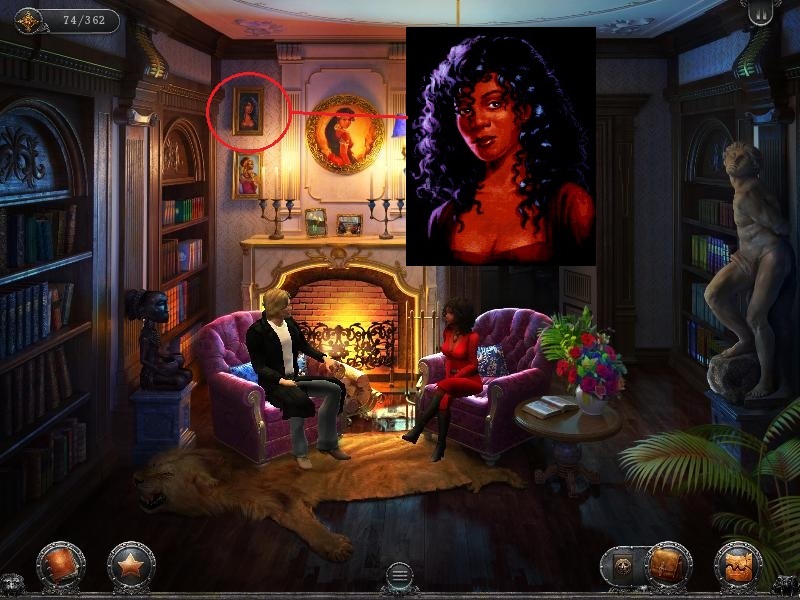 This Easter Egg also appeared in the original Gabriel Knight 1. In the original game we can hear 3 versions of the song "When the Saints go marching in" at Jackson Square: cajun, blues and jazz versions played by the 3 bands. In the remake there are only 2 bands playing at Jackson Square, playing the cajun and jazz versions. From day 3 on however, Gabriel can ask the jazz band to play the blues version. All 3 versions are in the music player.